While working on the house I noticed that I spent a significant amount of time searching for tools every day. I had no problems finding the big power tools. It was the tape measure, my pencils, and my framing square, which seemed to wander off into the far corners of the house. The pros know about this problem all too well. Their solution is the tool belt. The belt keeps all frequently used hand tools on the person at all times. A tool belt was what I needed. I looked around for a good option and landed on the DeWalt DG5617 tool belt system. The DG5617 is a complete system with suspenders and apple pocket space. It needs no upgrades to perform, and I won't be buying extras in the next few years. After using my belt for a while, I have come to realize that The belt is an essential tool of the trade. It saves the wearer minutes of time every hour. My tape measure now lives in one place. I know where it is at all times. The same goes for other tools like my framing square, pencils, and even my digital tape measure. For certain activities like nailing while on a ladder, the belt replaces the box of nails. I carry my in a dedicated pouch instead of the box they came in. No more trips down the ladder to pick up screws I dropped. Thanks to the holster the screw gun is ready to go with only one hand. The other hand is free to position the workpiece. Best of all, when I get started in the morning I am ready to go after I put on my tool belt. Everything I need is where I left it the night before. A good belt not only carries a lot of tools, it also distributes the tools in such a way that their bulk becomes barely noticeable on the user's body. A wide strap and padded back allow the belt to distribute the weight on the user's hips. Suspenders become necessary when the weight of the tools increase or the weight is distributes unevenly. The belt itself can only support so much weight until the user feels an uncomfortable tug around their belt line. A single screw gun is enough to make that happen, especially if it is not counter-balanced with a weight on the other side. Suspenders move much of the weight from the belt line to the user's shoulders. If you are planning on carrying anything above 5lbs on your belt, suspenders are a necessity. The bags on the DG5120 are standard issue. They follow the tried and true design that is common among tool belts at the moment. The bags offer plenty of space for all your tools, but do not innovate in any significant way. The hammer holder on the bag of the belt does its job. It'll hold a hammer securely, and keeps it from slapping against your legs while walking. As noted by other reviewers, the suspenders on the DeWalt are attached to the belt with Velcro. When new the Velcro straps will support any load a reasonable person will carry on their tool belt. I can see the straps wearing out, if they are opened and closed a lot. I have no doubt, however, that I'll get a lot of use out my belt before than happens. Since I use the belt with the suspenders at all times, I will sew the Velcro shut should it fail. One the plus side, the Velcro loops on the suspender are not as noticeable as the metal clasps on other belts are. The shoulder straps are heavily padded. Carrying ~10lbs with the suspenders attached feels comfortable. The belt feels very comfortable on my hips. It's wide straps and padded back distribute the weight well. The large front clasp makes the belt easy to get into and out of. At about 5-7lbs the belt reached it's limits. It becomes uncomfortable to carry such a lead with the belt alone. With the suspenders attached, the issues go away. I noticed no uncomfortable forces while testing the belt with ~15lbs. My loadout will be below 5lbs most of the time. This is well within the comfort range of the DG5120. The DG5120 is made from durable nylon. The material is abrasion resistant and takes dirt and abuse well. It's practically impossible to tear. Nothing you can put on the belt and still lift under your own power will damage the belt. If the tool belt will fail, it will be at the seams. Workmanship on the belt is very high. I did not encounter any lose seams or threads on my belt. The belt is, undoubtedly, not as durable as a leather belt would be. I do believe, however, that the DG5120 will last for many years under almost any work site conditions. What you get for the slightly lower durability compared to leather, is a material that is more pliable and, arguably, more comfortable than leather. I upgraded my belt with the DG5120 screw gun holster. My impact driver is probably my most frequently used power tool. I like to have it nearby at all times. With the two bags that comes standard with the belt attach, there is little room for the holster. I removed one of the bags, which I don't really need anyways. With a bag on one side and the gun on the other, the belt is balanced. The holster works well for my impact driver. After a short break-in period, the driver stays in the holster without having to close the clasp. The holster also provides additional storage for bits. The DG5120 has been a very worthwhile upgrade for me. 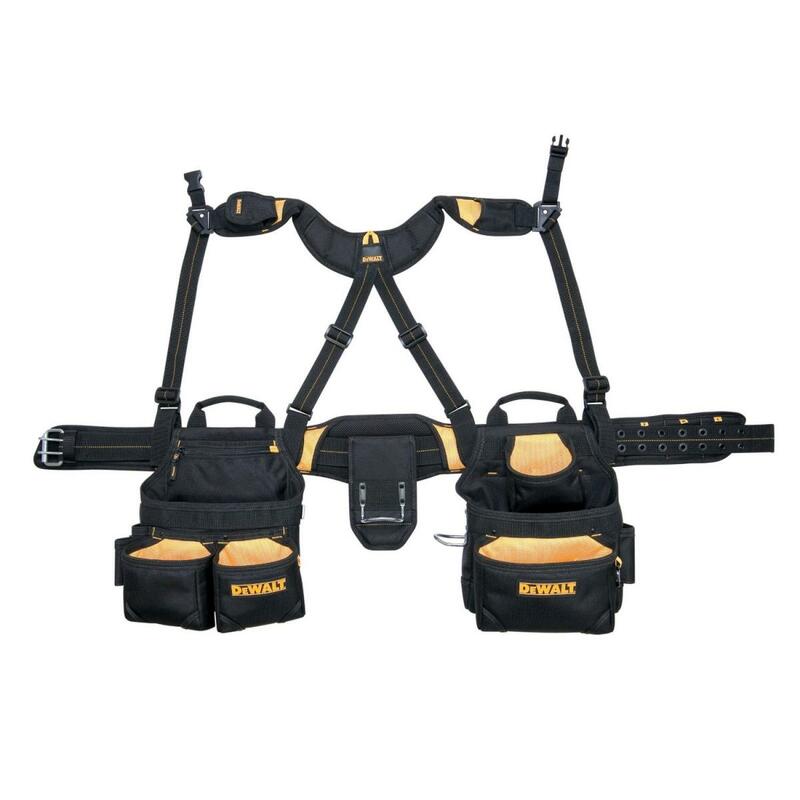 The DeWalt DG5617 tool belt combo is great choice for your first tool belt. It comes with everything you'd want. The belt can be configured to suit your needs. Use it with the suspenders, or without. Reconfigure the bags to meet the demands of your work. Made from durable materials, the DG5617 will withstand years of daily use. 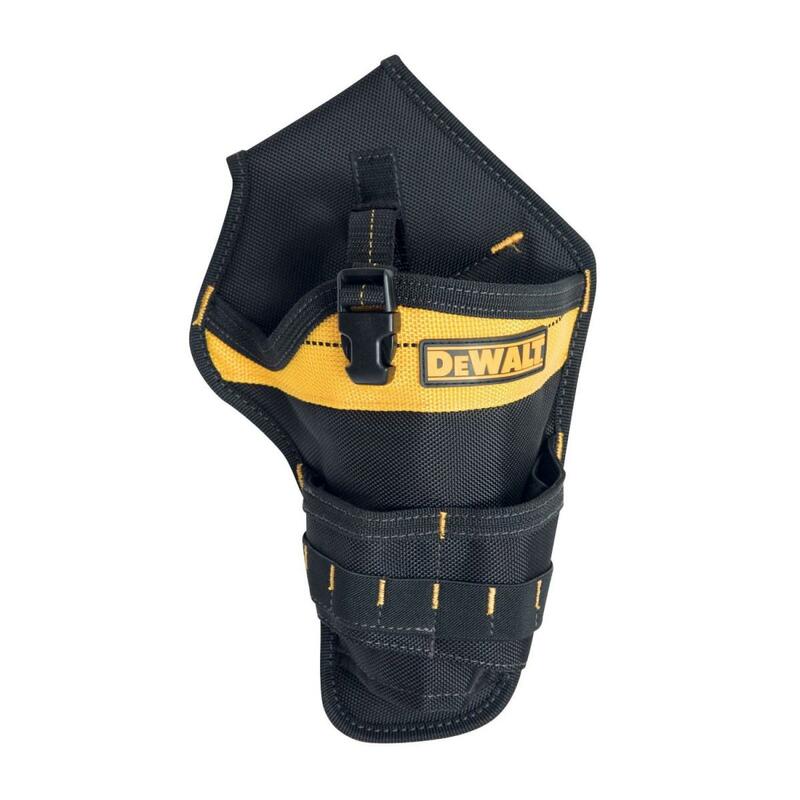 Add to that a moderate price tag, and we have a great tool belt from DeWalt.